They give a handy checklist for each phase (reproduced below). The checklists are comprehensive (significantly more than my little list of questions) and I think they stand-alone, but the whole paper is well worth a read. 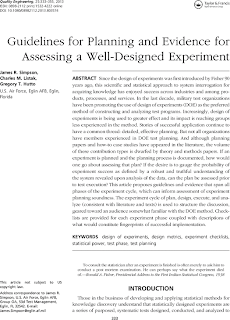 Design of experiments is more than just math, as this paper stresses it is a strategy for discovery. Risks associated with test execution estimated, including safety, ability to secure test resources, issues with interrupting normal operations, test staffing, etc.